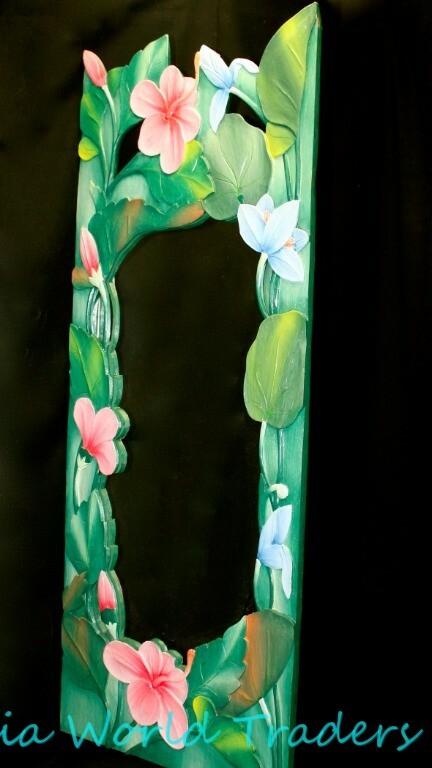 Home > Products > Balinese Wood Mirror Hibiscus Flowers Hand Carved Frame Bali Wall Art 40" X 15"
Balinese Wood Mirror Hibiscus Flowers Hand Carved Frame Bali Wall Art 40" X 15"
Add eclectic flavor to any room with this unique hand crafted mirror! Artisan made on the island of Bali, hand carved of albesia wood with beautiful hibiscus flowers! Hand painted with lush foliage in shades of serene green, with pink and blue hibiscus flowers. This mirror is a classic Bali style that is getting harder to find these days, we had these made to order just for our shop. Perfect in groupings or on it's own. Complete with hook on the back and ready for hanging. A great gift and a perfect way to add a touch of Bali Magic to your home! Each mirror my be slightly different placement of the flowers than the photos provided, this is not a flaw, but a reflection of the hand crafted origins of this unique product. Will go beautifully with many types of decor! Check out my other items!We have a great selection of fun stuff! Be sure to add me to your favorites list!And stay updated on our latest listings! We will ship your item with in 1 day of receiving a cleared payment. In most cases we will ship the same day payment clears. When we can, we ship USPS priority mail, cost includes confirmation/tracking number. On larger pieces we use UPS or Fed Ex as this is more cost effective for the buyer. When an item is shipped UPS or Fed Ex shipping cost will include tracking and insurance. We require a phone number for shipping purposes. The buyer is responsible to pay for any customs duties or fees that may be incurred in their country. We are also not responsible for any delays that may be caused by your countries customs regulations. We do all we can to ensure your purchase is shipped in a timely manner. And please do not request that we mark your purchase as a gift. Thank you for understanding. Any claims must be made with in 30 days of receiving your order. Please contact us first for correct return instructions. Your item may be exchanged or you may opt for a refund less shipping and handling charges. Buyer is also responsible for any return shipping cost. All returns should be sent to our Trenton Maine USA office for processing. If you have a problem with your item, please contact us to resolve the issue before leaving us feedback. We are here to work with you, your satisfaction is our #1 priority. Visit our store in the Acadia National Park region of Maine. On the road to Bar Harbor, to check ot our entire collection of Unique treasures from Bali & Beyond! On the Bar Harbor road in Trenton Maine.